When you find the need to feed a weak colony in the midst of winter, there are may things you must be careful of. The bees need to be able to access the food when clustered. It only takes a short cold spell for the bees to starve if the cluster can not get to food. You need to be careful not to chill the bees while giving them feed. You don’t want to feed syrup as the excess moisture can easily cause dysentery/nosema in weak colonies. What I have found to work quite well is to make sugar blocks and place them over the hole in the inner cover. 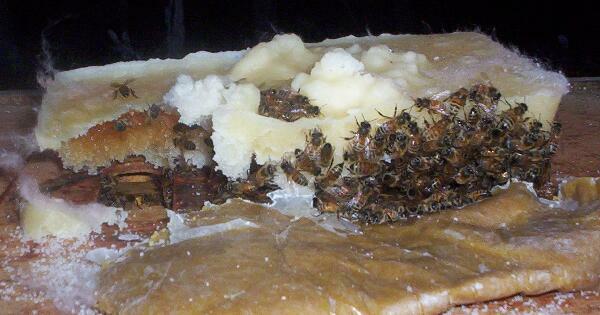 Assuming that the bees follow their natural progression upward as they consume stores, they will end up at the inner cover. For this to work, proper Fall planning is needed to remove all empty supers so that there are stores all the way up to the top. 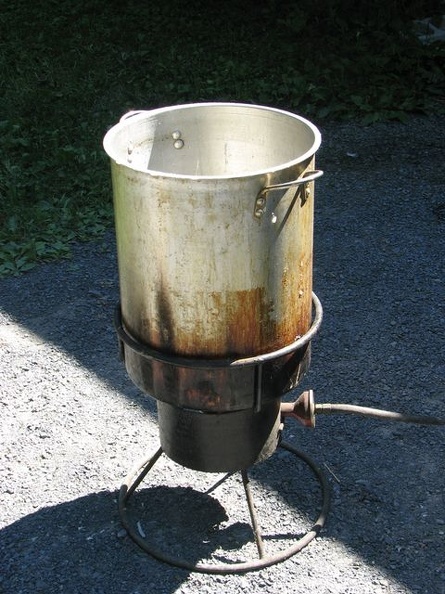 I found that an old turkey fryer works great for making the sugar candy. I use the following candy recipe, you can cut it as needed. Place water and vinegar into a large cooking kettle and bring to a boil. Slowly add sugar (1/3rd at a time) and continue to stir. Keep stirring and heating until it thickens (~270F) to the consistency of cooked oatmeal. It takes time so be patient. Remove from heat and wait until boiling stops and then pour into the molds. Use extreme caution, the sugar will burn you really bad if you get it on you. When it is cool, I just pop it out and place it over the inner cover holes. Put an empty super around it and cover it with a pieces of insulation batten followed by the telescoping cover. You can easily check them by lifting up the insulation and add another block of sugar if needed. Here is a short video of the sugar boiling so you can get an idea of the consistency if you do not have a candy thermometer. I would recommend getting a candy thermometer if you don’t have one, otherwise you may end up with a sticky mess. I find 270-275F gives me the best results. 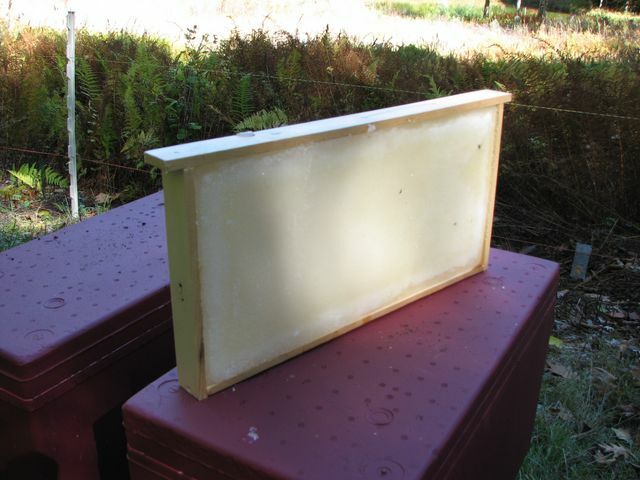 Another method I employ when I know I have a weak hive going into Winter is the use of a sugar board. Weak colonies will have a hard time storing away large quantities of syrup and thickening it enough to cap before the cold sets in. I make the sugar boards by simply constructing a 2 inch high bottomless box the same dimensions as a hive body. A small entrance (~1-1/2″ x ~3/8″) is cut in the sugar board to provide ventilation for moisture and for cleansing flights. The bottom is covered with 1/2″ hardware cloth which will hold any sugar chunks, that crack, from falling out of the board, and still allows easy access for the bees. It also makes summer storing of any unused sugar easier. The bees tend to eat the sugar from the outside edges, so most of the time, there will be big chunks freed from the board. I have tried many different designs and found this to work the best. Although a solid top allows for easier filling, once on the hive, you have no way to see how much of the sugar they have consumed without lifting the sugar board and exposing the whole cluster to the frigid air. I lay the sugar board top side down (hardware cloth up) on piece of plastic on the garage floor. Using the recipe above, I pour the molten sugar up to the entrance cut out. Once hardened, I remove the plastic. A 25lb bag of sugar will fill one sugar board. 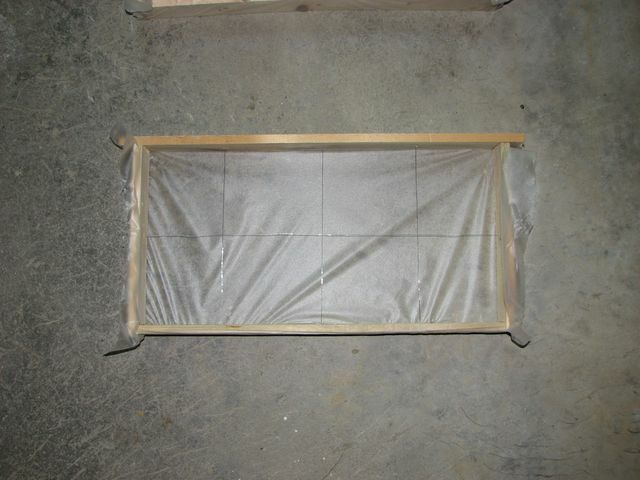 The sugar board is placed, hardware cloth side down, right on top of the brood chamber without the use of an inner cover. This allows the cluster to move right from the tops of the frames to the sugar. I then place an empty medium super on top of the sugar board with a piece of rigid insulation board, or insulation batten inside, followed by the top cover. 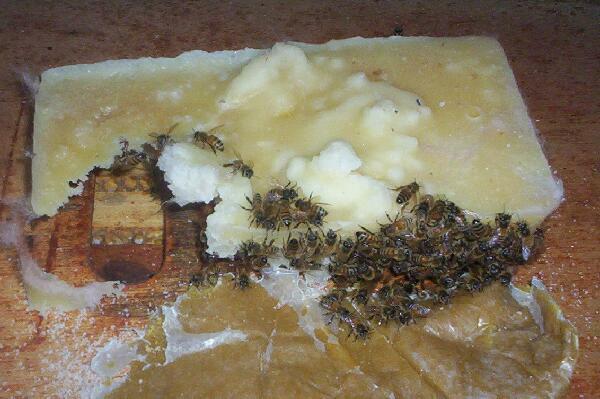 You can periodically check on the consumption without disturbing the bees by just lifting the insulation. 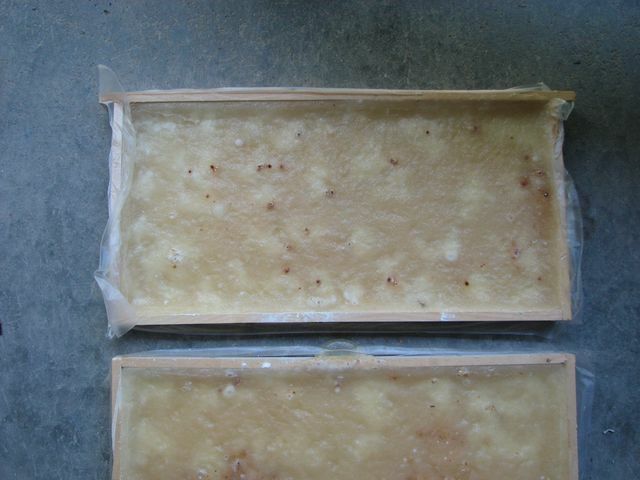 Another advantage to the sugar board, is that the sugar absorbs any condensation that forms over the cluster and helps reduce the humidity in the hive. Another method that I have been using lately with polystyrene nucs is a sugar frame. I construct them by ripping 3/8″ strips from 2x6s and creating a box with the same outside dimensions as a standard frame. I wire them with both horizontal and vertical wires to give then strength as well as keeping the sugar in place. To fill them with sugar, I put a piece of Glad wrap on one side and lay them on the concrete floor in my garage to pour the molten sugar. Once the sugar hardens I then just peel the Glad wrap off. 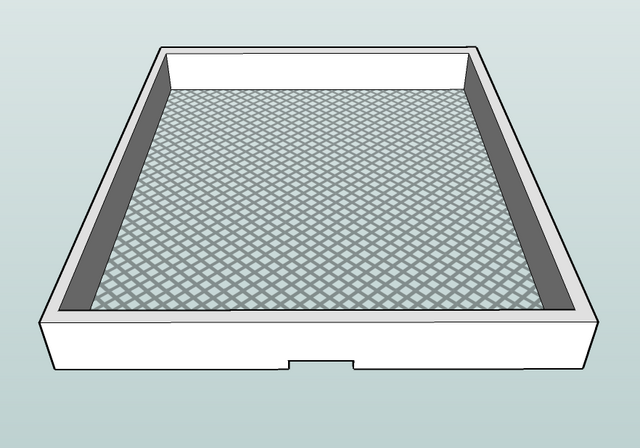 I put one of these frames in a 5 frame polystyrene nuc with 4 frames of comb. Each frame holds about 9 pounds of sugar. I’ve also been adding dried natural pollen and some dried powdered pollen substitute to the frames as well. This gives the bees some source of protein if needed, as the nucs have very little stored pollen. These frames can also be given to full size colonies in place of division board feeders without the worry of bees drowning or the syrup causing dysentery. It sounds like you are either not using a hot enough burner or trying to make too much at one time for the size of your burner. It takes a lot of heat to keep it boiling. If it starts to crust on top, it is not getting enough heat. Well I added water can’t say how much enough though to get it back to what it was before and stirred for long time got up to 253 F according to the laser thermometer and it started to get thick again so took it off heat and let it continue boil on it’s own and when I noticed it was not much noise I took it down stairs and put it into my three frames hope they harden as it seems stove top can’t do it. Well just want to say that the candy did harden and three frames was 20 pounds. Well see how bees make out now. Frost has started. I’m so happy I found your awesome sight. This January I had some bees running out of food, but gave them 2:1 sugar:water. I don’t know if they have made it this far, but I really wish I found your site earlier. I was definitely concerned about them needing to evaporate water in the colder temperature. Robo, for the candy board poured into the hive frame, how much sugar and water is needed to fill one frame? My frames are wider than a standard and weigh ~10lbs when full. Can’t answer your direct questions because I still make 25lb sugar batch at a time. I was wondering about stirring in a little honey in the mixture right at the end just as the cooling starts to entice the bees or would it be detrimental? If you have ever made candy, you know that it still retains a tremendous amount of heat even after it has hardened. The temperature you would have to add the honey at to get it mixed in, would greatly increase HMF in the honey. Secondly, when bees are starving, there is no need to entice them. It is your call, but I would highly recommend against it. I don’t see any value, but do see the danger of higher HMF. I tried making the hard candy frame yesterday. Worked very well, I was even surprised that glad wrap would not melt, but sure enough it did not. When I poured the first time, the mixture was at 270F and it was golden color. I thought I kept it on too long, so when I poured the second mixture, I took it off when it was at 260F. Very similar in appearance and outcome. In fact my sugar beging turning color right around 190F. The frames and the floor need to be almost perfect, because there was a little bit of sugar seeping from underneat the frame, but the wrap helped with that. So everyone, don’t economize on the wrap. Another thing I noticed is that when boiling of the mixture starts it does not overboil and spill from the pot. I just kind of hums along and as it looses water the temperature goes up a little at a time. My double-spiral electric stove top worked extremely well for 12lb sugar portions. Help, our sugar boards did not harden! Any suggestions? Sounds like you didn’t get it to a high enough temperature. The best thing to do at this point is to add more water so that you can heat it again without burning it. As long as it is not burnt, you can just start again. Add enough water and slowly heat until it is dissolved and then boil until it gets to ~270F which should give you a nice hard candy when cooled. As far as making hard candy, I was wandering if there is a reason why you start out with 25 lb to 2 quarts of water. It seems that the temperature cannot go up until a certain amount of water evaporates. So it raises fairly rapidly until it reaches 240 and then really slows down the heating rate. Have you tried starting with higher sugar to water concentration, so that less time and energy is used for making hard candy? There is a fine line between getting the sugar to dissolve and burning the sugar. Even using 2 quarts, I have to add the sugar in two batches. I start by boiling the water and adding 1/2 the sugar, which drastically lowers the temperature of the water. I keep heating it until the added sugar is dissolved. Then when hot enough I add the last 1/2 of sugar and continue heating until it is up to temperature. I’m sure you could start with less, but it will require much closer monitoring to prevent burning the sugar. I tried something different this time. Instead of making special frames for this, I simply used a normal medium frame with a wood guide inserted into the topbar. Then I cutout a piece of plywood that would fit inside the frame between two side bars but is about 3 inches taller than a medium frame. I place glad wrap on the plywood and then snugly placed frame on top of the plywood. Since the frame tapers down, I raised the bottom part of the plywood about 1/2 inch off the table. I poured sugar into the frames and it performed as well as in your method. The side bars eye holes leaked a little, but overall not too bad. Why did I do that? Well, I noticed that once bees eat the sugar, then start building wild comb in the frame. 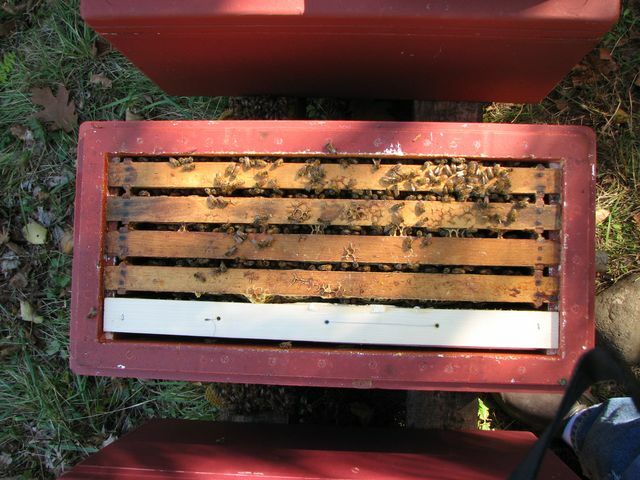 Since this is a perfectly normal frame, I think that once they eat around the wood guide on the top bar, they’ll attach the comb just as they wood in the topbar hive, but this time I will be able to keep the comb. I chose to also drill a 1.25 inch hole near the top bar through the sugar so that bees can travel thru the feeder. The drilled sugarbits are just like foundant, very flexible and great for queen cage stops. I think the core of the frame is soft, even though the sugar is very dry on the outsides. A 12 lb sugar portion yeilds 3 perfect medium frame feeders around 4.4 lb each. I live in East TN and merged a weak with a strong hive summer to late summer. I fed the bees sugar/water mix in a container that replaces two frames early fall. Still wasn’t sure they’d have enough to eat, so I made a sugar block (1 lb. sugar:1C water heated to just under 250, then set up for a couple of days). I couldn’t get the sugar block out of the pie pan, so I inverted the pan onto the top of the frames today, set the inside cover on it, then replaced the outside cover. Should I have done something differently? Thanks so much for any guidance you can give!